Bagar (बागड़) refers to the sandy tract of north-western India and eastern parts of current Pakistan bordering India. People of Bagar speak Bagri (बागड़ी), a dialect of overlapping Rajasthani language , Haryanvi language and punjabi language of the Indo-Aryan family, spoken by about five million speakers, which includes Hanumangarh , Sriganganagar districts and some villages of Taranagar tehsil of Rajasthan ,Sirsa and Fatehabad district of Haryana , Fazilka district and some parts of Muktsar district of Punjab . Bagar tract is long strip of shifting sand dunes called tibba (टिब्बा) and finer lands between them called lal (लाळ ) sandy tract in along the western border of Haryana and eastern border of Rajasthan. 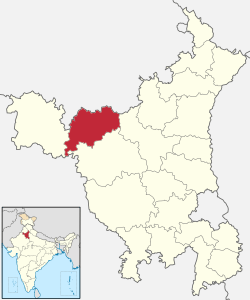 In Haryana, it covers southern parts of Sirsa district; western parts of Fatehabad district; parts of Hisar district. In Rajasthan, it covers parts of tehsils of Ganganagar; Bhadra, Nohar in Hanumangarh district; Taranagar tehsil in Churu district. 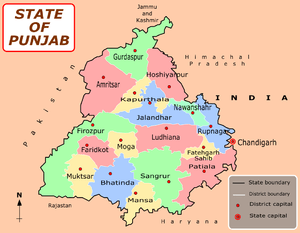 In Punjab (India), bagar tract covers Fazilka district and southern villages of Muktsar district. 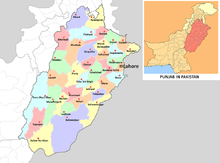 In Punjab, Pakistan, Bagri as minor language is spoken in Bahawalpur and Bahawalnagar district, though these are not considered parts of Bagar tract.